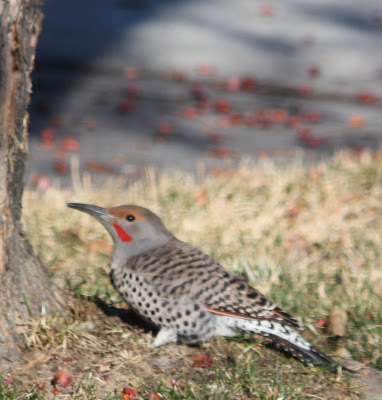 I was doing an interview for my news world job this morning with a gal in Montana, who said the Audubon report about birds moving north documented how the Northern Flicker was now common in areas of Montana in the winter - and 40 years ago - it was a bird rarely seen. I accused her of "stealing" our flickers, because I honestly hadn't seen one all winter, and they're hard to miss. I call them clowns, because they are big and clumsy at the bird feeders. Well, look who showed up this morning. Maybe this one knew we were talking about him.